Kel Elliott & Her Three Man Orchestra. The ‘Truth and Tall Tales’ Tour – great music, songs and fun. Kel Elliott & Her Three Man Orchestra are a joy to listen to and true crowd-pleasers who guarantee an evening of great entertainment with their friendly fun and frolics. Kel Elliott is a sassy double-bass playing singer who likes to tell stories: her own and other people’s. She spends a lot of time striking up conversations, and whenever she can, records them, turning the bits that inspire her most into songs. She then hammers or rather plucks them out on stage with humour, irony and a touch of mischief. The audience describe her performances as a journey of emotion, many laugh and a few tears shed, all within the space of a few minutes. Others describe it as a ‘Drama for the ears’. The band’s sound is varied and cleverly tailored to suit each song, allowing the lyrics to speak for themselves. Joining Kel is song-writing partner Kelvin and two new multi-instrumentalists, Hugh (Kel’s hugely talented husband and inventor of the plastic trombone) and Adam (woodwind maestro for the Royal Shakespeare Company). To match Kel’s velvety vocals and trademark double bass, this new show features an impressive range of instruments, from melodica and bass clarinet, to sousaphone, saxophone, accordion, ukulele and percussion. This is very much a gig for grown ups and mature youngsters; great music with universal appeal from a fantastic band! Following them on Facebook and social media is a good way to tap into the younger members of our community. Kel Elliott and her Three Man Orchestra gave us a brilliant and spirited nights entertainment on 5/5/2018 in Radcliffe on Trent. With Kel on double bass and vocals, the “orchestra” included a vast range of instruments (yes we counted 12 but can get upto 20 on occasions! …. and thats not including the vocal interpretations of some rare instruments!) 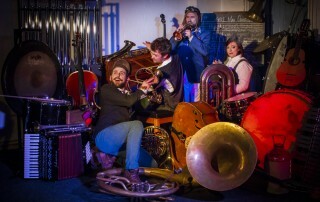 – melodica, accordion, bass clarinet, ukulele, and the surprise of an enormous sousaphone – hence the term ‘orchestra’!! Their programme was based on a passion for story telling, preserving old stories that may other wise be forgotten, and bringing them alive with a powerful emotional edge. One example being their treatment of a tale about Kelvin’s Grandad which was built around an original tape which had turned up in the family archives and featured Grandad singing “Louisiana”…. having fun connecting with a previous generation was very enjoyable. At times their story telling is used to bring alive a lost era, as in the case of the restoration of Chedham Yard, a prize-winning Heritage site in Warwickshire. Kel Elliot was commissioned to be involved in the restoration project by providing a musical journey to chart the story of bringing the smithies back to life – a vivid and powerful story of village life, characterised by instruments used. But Kel is also keen to express her feelings about some aspects of modern culture, for example her contempt for Simon Cowell, who she characterised as an Evil Ringmaster at the Circus , singing he ” humiliates to entertain, the vulnerable won’t complain” a phrase to remember I think. Or likewise Kel reflects on her somewhat rebellious teenage years and writes empathic ally about the sense of being misunderstood – ” the time she needs you most is when she’s pushing you away” – how often that continues in later life! A memorable evening in many ways, with four very creative musicians blending their own unique sense of fun and attachment to people, places and time, to produce a very polished performance. Another RadVentures-hosted event through the Live & Local touring scheme, sponsored by Arts Council England, Notts. CC and Rushcliffe BC. Twice winners of the BBC Radio 2 Folk Awards for best duo in 2016 and 2013, the couple’s on-stage intimacy and passion has build a huge and enduring fan base. 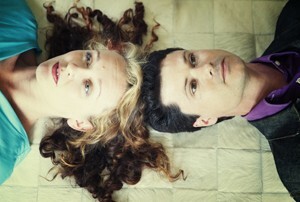 Their reputation as ‘Songwriters par excellence’ (FROOTS magazine), offers greatly varied and original songs covering a range of musical tales, from wicked mermaids to Norwegian legends … to a lonely whale. Following their last two highly praised albums ‘Tomorrow Will Follow Today‘ and ‘Hidden People‘ fans of Folk and acoustic music wonder where this couple will choose to lead them next. 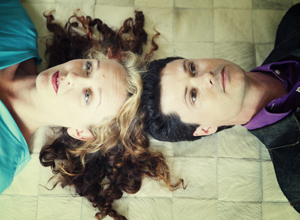 With over 20 years of music-making alongside Cara Dillon, The Levellers, Kate Rusby and Show of Hands, Kathryn Roberts and Sean Lakeman are stellar performers of Modern British Folk. 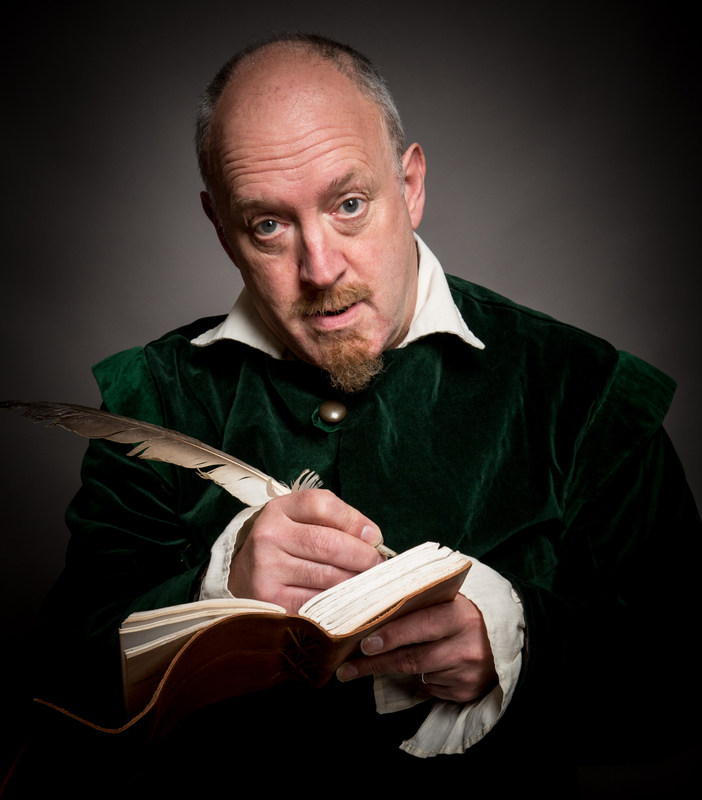 Your Bard – An informal interview with Will Shakespeare … a waspish comedic entertainment from our greatest literary hero – in the flesh! Picture the scene. A Professor is giving a talk about Shakespeare authorship in the function room at The Shakespeare pub – but he doesn’t believe the man from Stratford wrote all those plays. That’s Will’s cue to kick the door off the hinges and defend his reputation. We met the man himself and took the lid off a legend. He’ll told us all about his family, what it’s like on tour and the glory days at the Globe. 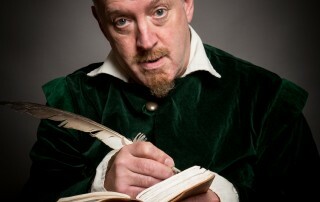 Queen Elizabeth I, Christopher Marlowe and Ned Alleyn – were there too too along with enjoying a few of his greatest hits, and maybe a sonnet or song thrown in for good measure. So, ladies and gentlemen, get ready to raise your glasses to …Your Bard! Another RadVentures-hosted event through the Live & Local touring scheme, sponsored by Arts Council England, Notts. C.C and Rushcliffe B.C.